The following is NATO’s military policy on information operations. 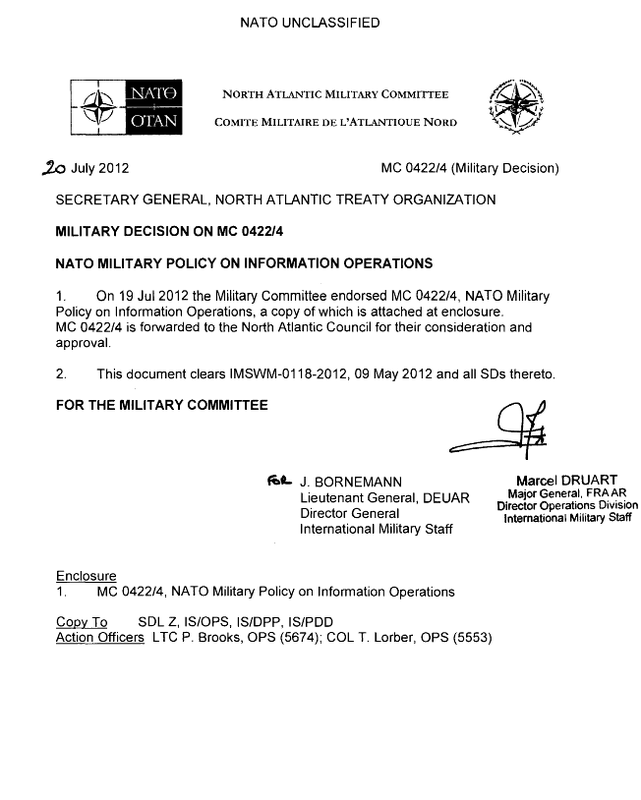 Though unclassified, NATO doctrine documents are not released to the public. Info Ops is a staff function to analyze, plan, assess and integrate activities focused on the IE rather than a capability in its own right. As a staff function, Info Ops provides the Commander with an assessment of the IE and a mechanism to plan and coordinate Information Activities on a continuous basis to achieve Information Effects in support of operational objectives. At the Political-Military (Pol-Mil) level, the North Atlantic Council (NAC) and the Military Committee (MC), establish mission specific guidance, including StratCom guidance, to enable and maximize the effects of all information-related aspects of NATO’s operations and activities. Throughout the full spectrum of operations, peace, crisis and conflict, the integration and implementation of IA at every level of command is essential to overall success. The early application of IA can save resources, improve force protection and the effectiveness and efficiency of military capabilities through the establishment of planning and targeting priorities, and deconfliction and synchronization of activities. The focus of Info Ops is on preserving and protecting alliance activities in the IE at all times while addressing, during military operations, NAC approved audiences, whose effectiveness is a function of their will, understanding and capabilities. As part of the operational and tactical planning, Info Ops plans, coordinates IA to reinforce or affect changes in behaviour, influence the will, shape perceptions, improve or degrade capabilities, and affect information and information systems. c. Counter adversary’s propaganda as well as command functions and capabilities which support his opinion-forming and decision making processes. Counter-Propaganda is a multidiscipline effort led and coordinated by Info Ops to analyse an adversary’s counter command and propaganda activities, to develop approaches and synchronize actions to counter these as appropriate. NATO PSYOPS forces and assets, supported by other functions, take a lead role in the analysis of adversary’s propaganda and support a variety of IA to counter it.